•	Navigate your spaceship through the asteroid field! •	Place the 8 puzzle pieces on the game board as indicated. Pay attention to the exact orientation of each puzzle piece! •	Slide the puzzle pieces to help your spaceship find the exit and escape. 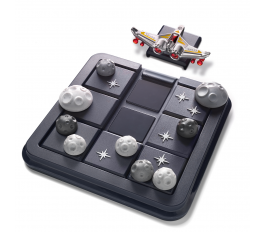 •	Remember: Asteroids and the spaceship cannot overlap each other and must stay horizontal on the game board! Tilting or lifting up puzzle pieces and the spaceship is not allowed! •	You have found a solution when the spaceship can fly off the game board. Game board with lid, great for travel!